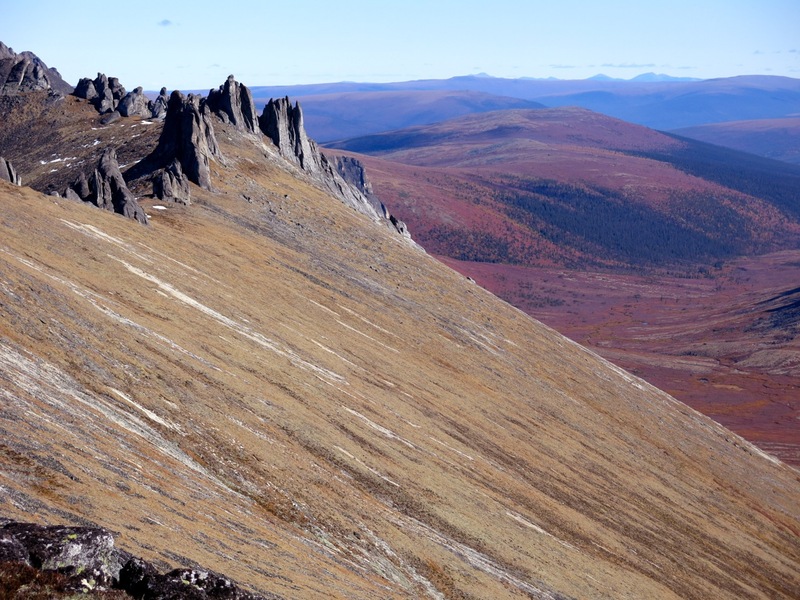 I now understand why Chuck Comstock raved about the White Mountains which are located northeast of Fairbanks. Comstock and I served in the Coast Guard together in Valdez and after his discharge he wandered off to Fairbanks to get a degree in Geology and a residency at the Sandvik House, the hub of the climbing community in that part of Alaska. Though we took different sporting paths we were good friends. 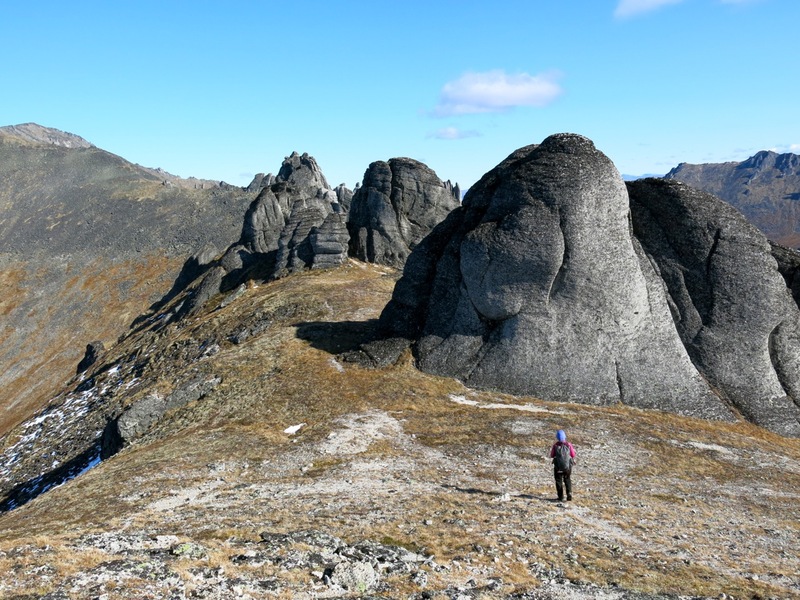 Tabitha and I made an attempt to explore the White Mountains many years ago when we were returning from the Brooks Range, but rain and winds there drove us instead to the impressive Granite Tors east of Fairbanks. The Tors remained our only hike in the area until this weekend. On this trip, it became apparent why Comstock was so jazzed about the rock climbing in the area. Comstock was well-known for his wilderness adventures. 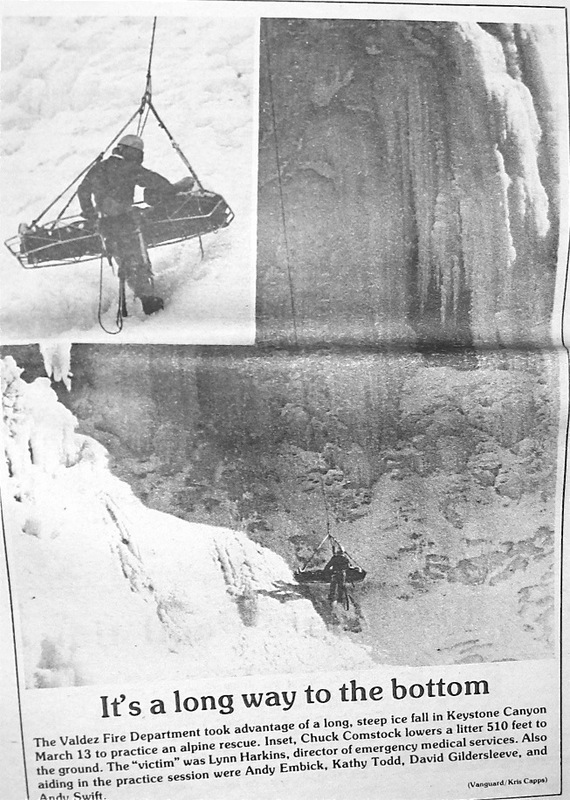 He pioneered many of the icefalls around Valdez and Alaska including the Vug Tor in the Katchitinas with Roman Dial. He also helped scribe the vertical logs and rafter logs for Thompson Pass Mountain Chalet, and thus helped me fulfill my dream of ski guiding in the Chugach. He was a relentless and skilled mountaineer with a dose of recklessness that made him a legend in Alaska. He passed away more than a decade ago. Comstock’s rave reviews of the White Mountains stuck in my mind, so when we decided to head north again, I thought of Chuck. Along with the amazing fall colors, the weather was picture perfect for one last trip to close out our amazing summer in Alaska. The White Mountains National Recreation Area is a BLM managed public resource. The mostly rolling terrain is covered with trails and some areas are non-motorized, including the Mount Prindle Resource Natural Area(pdf). There are numerous public use cabins dotted across the area, and they remain open year round. Our trailhead to quiet wilderness was located about 65 miles up the Steese Highway at the Mt. Prindle Campground. We arrived at the trailhead at noon and quickly prepared meals and packed our packs. Immediately we crossed two creeks which are best done with sandals. Once across the creeks, the valley opens and the route becomes clear. After a few miles of roaming the narrow trail through sporadic small bogs, we selected a campsite at the base of the first set of tors as recommended in the guide book, Outside in the Interior by Kyle Joly. Winds to 15 mph blew into the night. 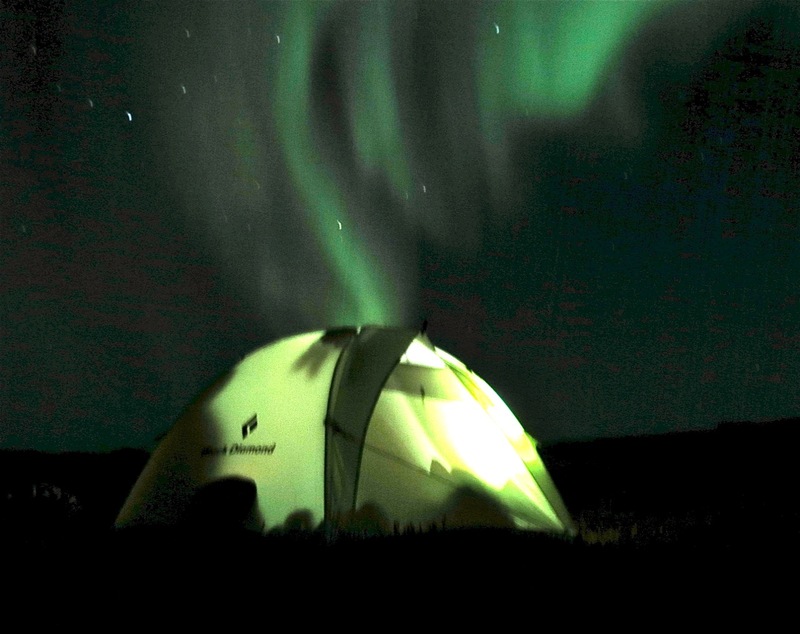 By midnight, the sky was ablaze in northern lights, so bright they nearly cast shadows. Frost smothered our camp in the morning. With some confusion as to our objectives, we escaped the tent once it warmed up and began heading upwards. 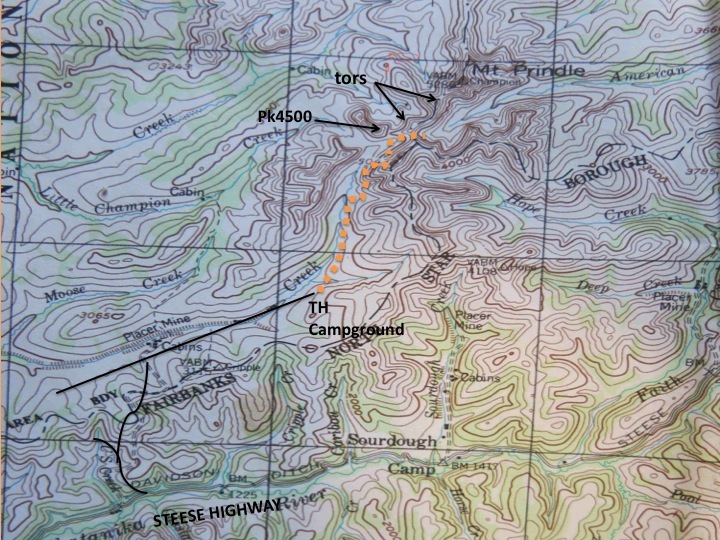 I spotted a route directly above the camp that would allow us to gain a summit and a view of the area. While Mt. 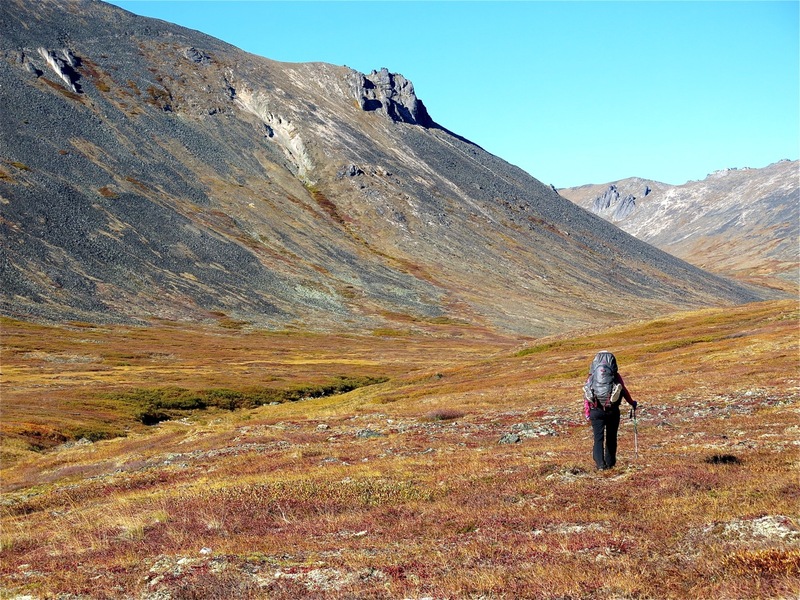 Prindle is a worthwhile objective, the immediate area of our camp offered some attractive steep hikes. So, before heading to the tors, we hiked this. 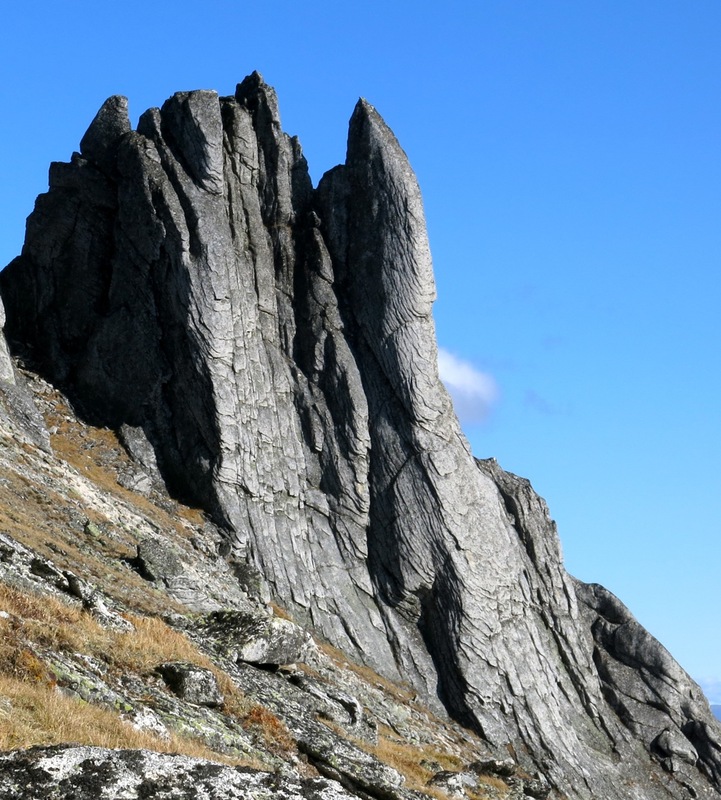 That route passed by one particular staggering column of granite, striking as it rose from steep scree. Once on top of this route, and throughout our hike, we had views of the entire range. Distant anomalies caught our attention. Back to Comstock. I have little doubt he spent quite a bit of time climbing in the area now that I’ve seen the rock features. Some bigger routes fall off the north side of Mt. 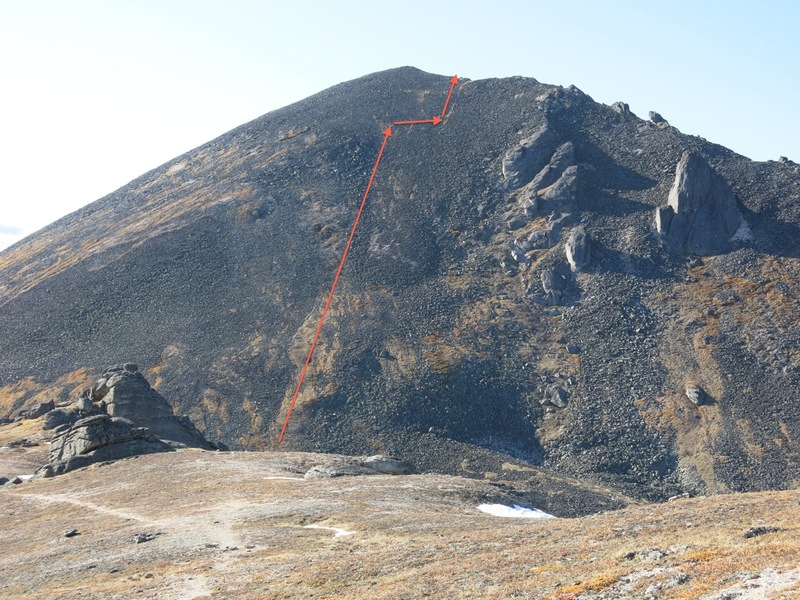 Prindle, and Stan Justice of Fairbanks has written a climbing guide for the area which is the Bible of technical routes for the White Mountains. Most of these routes are accessible within a few hours of the trailhead. 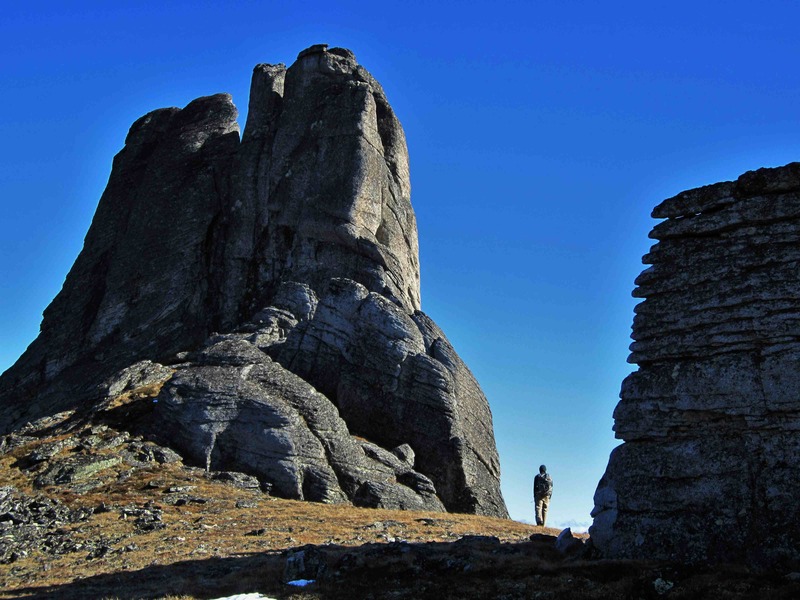 There are two sets of tors and hiking through, under and around the forms is something few Alaskans experience. 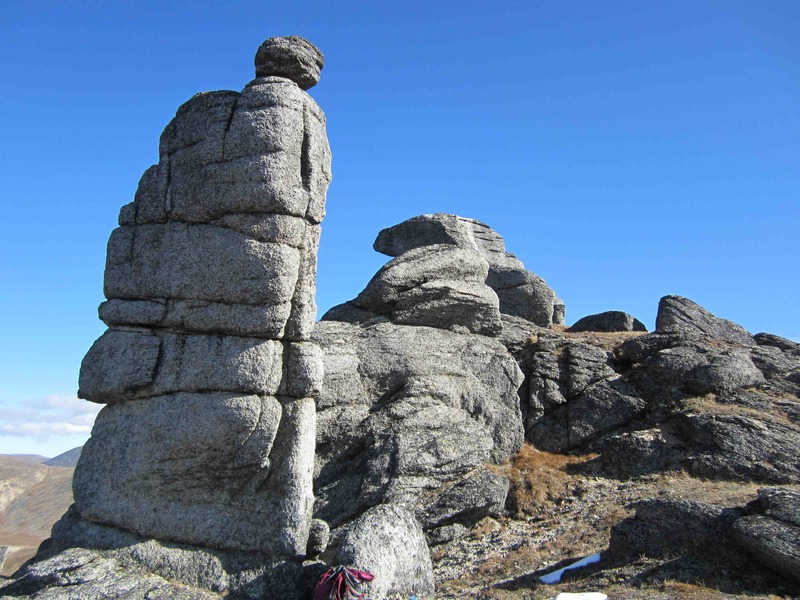 I can imagine Comstock and his dog Tenzing, free-handing these bulbous balls of granite and then heading off to a crack. We were surprised that such a place exists apart from the more common attractions in Alaska. Once through the lower tors, one climbs up a small summit and then suddenly the upper tors tear from the earth. Below, Alaska stretches out for Canada. In the far distance, Mt. Prindle is the high point of this social trail. Tent camping is not allowed in this area, including the summit where sheep roam. (Comstock would have camped there anyway!). This was the most impressive piece of granite of the many slabs slipping upward, and certainly a formidable challenge for a rock-climber. The hiker’s route goes around the opposite side.